A dry-air environment with low humidity levels indoors can be cause for concern for a number of reasons. For one, dry air can cause your skin to dry out, itch, and peel. In fact, your skin can become infected if you don’t treat your dry skin. Additionally, when flu season comes around, your home is more likely to be at risk due to the low indoor humidity. Dry air can be a burden on asthma patients and people suffering from serious allergies. Apart from your health taking a hit, your valuables can too! Paint, wood, and electronics don’t respond well to dry air, therefore, installing a humidifier into your home can keep you in optimal health while keeping your possessions safe. For small households, single-room humidifiers can certainly do the trick and go a long way in helping control indoor air quality. Of course, if you’re actively using a forced-air heating system, dry skin is going to be a constant battle that you may end up losing unless you combat it with the right technology. A whole-home humidifier can help you address these problems as the humidifier is installed into your existing HVAC system. A whole-home humidifier uses your heating ducts to release water vapor into your home environment, providing a more comfortable climate. What’s more is that you can control the amount of humidity in your home using your programmable thermostat! 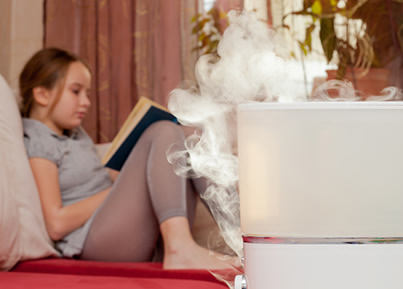 The biggest reward, for many homeowners, is the act of saving money with a humidifier. Since indoor humidity levels are going to be higher, you’ll feel less cold in the winter, opting not to crank up that thermostat. A bit of water vapor can go a long way in cutting your heating bills in half. If you’re tired of battling the winter months with dry and cracked skin, but also wish to properly maintain your possessions, a whole-home humidifier is a great investment! A local professional can easily take care of the installation process, just ask.